Truck drivers Garry McVey and Chloe Rimmington recognised for their efforts. NQX truck driver Chloe Rimmington won this year's NatRoad Youth Transport Award. A flawless driving record over 41 years has helped Garry McVey take out the 2015 NatRoad Professional Driver of the Year Award. McVey was one of three recipients of an award at this year’s NatRoad conference and was cited for his unblemished record and commitment to vehicle maintenance. NatRoad says the small fleet operator is committed to passing on his knowledge and skills to others. "If a young driver is looking to break into the industry, or if a driver wants to return to the trucking industry, Garry will give them a fair go - as long as that person has the right attitude," NatRoad says. "Garry runs his own business with a small fleet of trucks. He shares his safe driving attitude with others by taking the time to make sure they understand their fatigue management and work diary requirements." NatRoad says McVey began driving trucks at 18 years of age and has held a perfect driving record since. "Once it is in your blood it is in your blood," McVey says of the trucking industry. NatRoad adds that McVey has a strong commitment to vehicle maintenance and ensuring driver welfare is a priority. "Garry’s policy towards safe driving is that his drivers should always pull over if they feel tired and he will inform his customer if his driver will be late. This means his drivers won’t feel pressured and the customer won’t be let down," NatRoad says. McVey thanked NatRoad, and his wife for nominating him for the award. "I’m a bit embarrassed really," he says. Before walking away with his award, McVey told the conference: "Keep on trucking." His win puts him in the running to win the top driver award at the 2016 Trucking Australia conference. 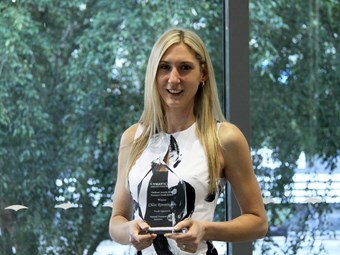 Fellow truck driver Chloe Rimmington won NatRoad’s Transport Youth Award for 2015. The 25-year-old Rimmington began working in the trucking industry at 17 as an administration assistant but soon switched to truck driving. She currently hauls freight for NQX in Mackay, Queensland. "Chloe’s duties include general freight, mine and shuttle runs, forklift operation and load restraint. By 19, Chloe obtained her HR [heavy rigid] licence and then went on to successfully gain her MC [multi-combination] licence," NatRoad says. "With these licences under her belt, Chloe was able to achieve her first HC [heavy combination] solo trip from Brisbane to Perth return – a remarkable achievement for a young driver." Upon receiving the award, Rimmington told the conference her trip to Perth "was the scariest thing I’ve ever done". She says NQX is an "absolutely fantastic company to work for" and that she is thankful for receiving the award. "Wow, what an honour," Rimmington says. NatRoad says Rimmington is an excellent team player at NQX and has a genuine desire to improve the transport industry. Rimmington does volunteer work in her local community and also volunteered to help rebuild Fiji from a natural disaster that struck the country. "Australia would be such a better place if more young people shared the same enthusiasm and values as Chloe Rimmington," NatRoad says. Meanwhile, the prize for Excellence in Operational Support went to Kerry Sheehan from Divall’s Earthmoving Bulk Haulage. Sheehan started working for the company in 2008 as a receptionist but quickly became heavily involved in the day-to-day running of Divall’s. "In 2009 Kerry took the initiative to be heavily involved in the setting up and smooth transition of the MT Data unit, which was installed into the bulk haulage department and its fleet of heavy vehicles," NatRoad says. "During 2011, Kerry took her role to a new level and became the key player and organiser for Divall’s when the transport manager was involved in a serious incident. Without hesitation, she dealt with the day-to-day running of the department and its associated needs, she was able to secure client confidence, liaise with appropriate personnel and arrange work for the entire fleet of heavy vehicles. "This undertaking saw Kerry work anywhere in the vicinity of 12-14 hours per day, whilst managing drivers, as well as tending to her own personal matters." NatRoad says Sheehan now aids in the daily management and organisation of Divall’s fleet and helps with vehicle allocation to meet customer requirements. "She is also responsible for organising all driver permits and authorisations and ensuring that driver medicals are carried out within specific timeframes," NatRoad says. "Kerry’s commitment to Divall’s can only be described as impressive. She is an outstanding employee and a worthy recipient of the NatRoad Award for Excellence in Operational Support for 2015." The awards were held on the second day of NatRoad's 2015 conference, which ran from August 13 to 15 in Brisbane. Truck drivers Garry McVey and Chloe Rimmington were among the award winners.